Perfect Team, first added in OOTP19, introduces a new play mode to OOTP: a collectible card game that allows you to build teams and play against thousands of other OOTP owners in online leagues, using the OOTP simulation engine. If you're new to Perfect Team, you may want to have a look at the Tips section below before you get started - there's no way of reloading your game after a mistake here, so you'll want to avoid those mistakes in the first place! During the league's regular season (Monday-Saturday), 31 league days are simulated every real day, one simulation every 30 minutes, starting at 10 AM ET and ending at 1 AM ET. 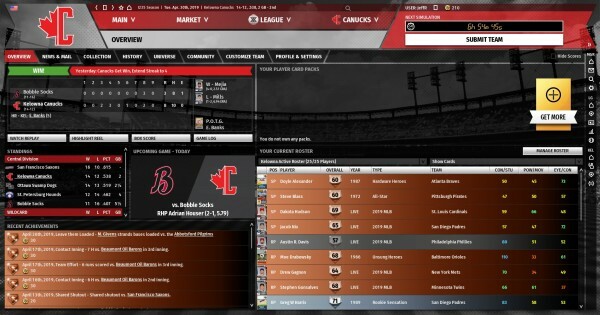 On Sundays the postseason will be simulated. In addition to the regular leagues, Entry Pool leagues for new players are also running, simulating one game every 30 minutes and running non-stop until the next week begins and the teams are assigned to a regular league. Leagues are sorted into different tiers: from the top down, they are Perfect, Diamond, Gold, Silver, Bronze, and Iron. Additionally, the Entry Pool league holds newly-created teams before their first assignment to a regular league (usually Iron, except in the first week following the game's release, where some teams may begin in higher leagues based on their Entry Pool record.) Every week, the teams with the best finishes in one level will be promoted to the next-highest one, while the teams with the worst records will be demoted down to make room for them. Teams will never be demoted out of an Iron league. new card packs of 6 cards each can be purchased for 1,000 Perfect Points; these packs are guaranteed to have at least one bronze-level card per pack. Gold packs can be purchased for 5,000 PP and guarantee at least one gold card (the odds of other cards in a gold pack are identical to the regular pack.) We may also have special packs for special events; prices for those are to be determined. cards can be sold immediately for a fixed amount, based on value category (regular card = 1 Perfect Point, bronze = 25 PP, silver = 100 PP, gold = 1,000 PP, diamond = 4,000 PP, perfect = 20,000 PP); if you do this, the card will simply disappear in our system and you get the PP added to your balance immediately. "Live" cards are tied to the 2019 Major League season; if a player's performance improves or declines during 2019 from the initial card values, his ratings will change. Remember that the Live (2019) cards will change their ratings as the season progresses. If a batter who starts the season with a 45 overall rating puts together an all-star year, his card will become much more valuable. Don't casually sell a cheap card for 5 PP early in the season only to find he's worth several thousand by July. Unless you need points immediately, auctioning your players will likely be more profitable than selling them off at face value - you can always use the auction option to sell them automatically if the auction fails. At one point in PT19, a Perfect card that would have drawn several hundred thousand PP on the auction house was sold for the basic 20,000 amount, costing his owner the equivalent of hundreds of standard packs. If you want a specific player or player type, watching the auction house and buying him there is usually a much more effective method than buying packs and hoping for the best. Wise auction spending will make a big difference in your overall success. Identify your biggest weaknesses and upgrade there first. After a few in-game weeks it should be apparent where your problem areas are. Conversely, don't bail out on a player just because he's had a rough month or even a bad season - there can be considerable variability in a player's results from year to year. If you're confident he's the right guy for your team, stick with him. When setting an auction price, be aware of both the card's auction history and any currently active auctions for the player - if there is a big supply of a particular card, you don't want yours to be the most expensive one. Always set a buyout price for your card, even if it's an outrageously high one - you never know when someone might actually pay it. Avoid using very short auction durations, particularly when it's not prime time (US daytime hours) - give everyone in the game a chance to see the auction. Remember the 10% auction house fee when you're setting prices - if your gold card is bought for 1000 PP, you only get 900 back! Always build in that 10% to your auction prices (i.e. set a gold no lower than 1111), or you'll be better off selling the card directly. Be cautious about your pitcher-batter roster balance - if you have too few of one or the other, the fatigue effects will hurt more than having an extra bench player will help. This applies to using fewer than 5 starting pitchers as well. Your ballpark settings can be tailored to help your team - or you team can be tailored to fit your ballpark. If you have an important game or series coming up, micromanaging your lineup to exploit your opponent's weaknesses can make the difference between winning and losing. You can train players to learn new positions by playing them regularly at that position. The amount of time it takes and the effectiveness of the player at a new position will depend on the player's other position(s) and defensive rating. Generally, the relation between the new and old positions on the defensive spectrum (DH-1B-LF-RF-3B-CF-2B-SS-C) will determine how fast a player can learn (a SS learning to play 1B will adapt very quickly, a 1B learning to play C will not.) Some positions will be impossible for some players to learn, e.g. someone who throws left-handed cannot become a shortstop. If you find yourself in a league full of much more talented teams, don't despair - the promotion and relegation system will eventually sort you into a level where you're more competitive. And remember, just like in OOTP, there's not a single pathway to success. Experiment with lineups and strategies, you may think of something that no one else has come up with yet!